June | 2015 | IS THERE JUSTICE IN THE CHURCH OF GOD IN CHRIST? THE CHURCH OF GOD IN CHRIST CONSTITUTIONAL CRISIS!! The Federal lawsuit filed by Pastor Andre Johnson and others was recently dismissed without prejudice, (it can be filed again). I have been informed, the technical items the Federal Judge stated were the cause of the dismissal are in the process of being corrected. It is possible it will be refiled in October 2015. The three branches of government of the Church of God in Christ, are in a power struggle. In my opinion and for reasons unknown, it appears the Legislative Branch (General Assembly) desires to undermine the authority of the Judicial Branch (Judiciary Board), this only benefits the remaining branch, the Executive Branch. Prior to April 1991, the General Assembly was the highest Judicial authority in the Church of God in Christ, there was no appeal from the decisions of the General Assembly. The Judiciary Board was created on April 11, 1991 at 8:15 p.m. and the Judicial Code was passed November 15, 1994. 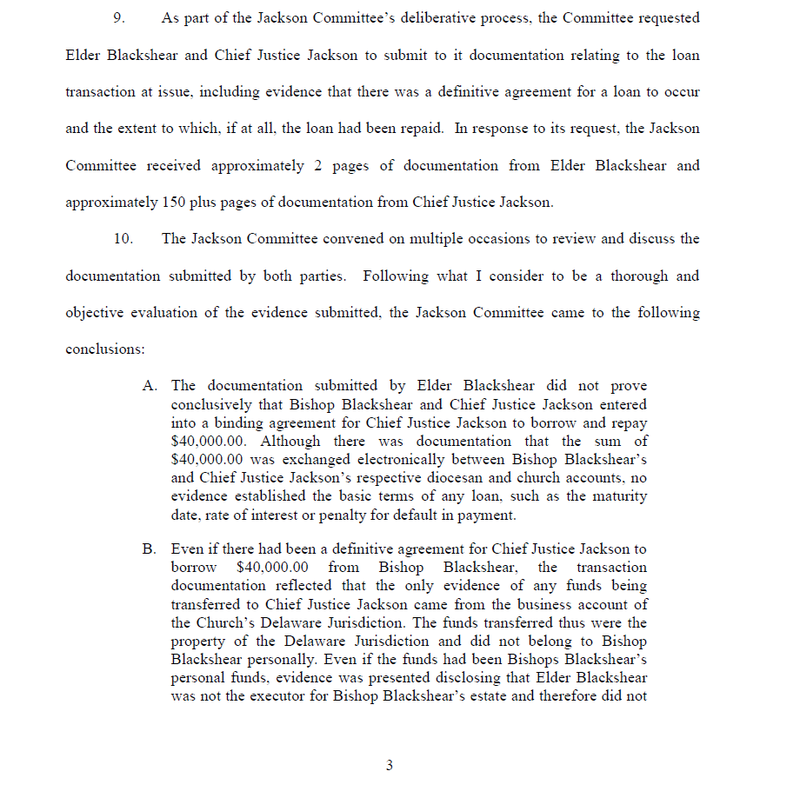 Click these links to view excerpts of the minutes when this transfer of authority was discussed and PASSED. I have taken excerpts from theses minutes and highlighted the previously mentioned portions for ease of reading. For copies of the complete minutes send a request through the contact form. COGIC CHIEF JUSTICE THOMAS JACKSON CLEARED OF ALL CHARGES!!! Chairman Lewis asked does the Board agree that Chief Justice Thomas Jackson is cleared of all the charges brought against him? All of the committee members agreed that Chief Justice Thomas Jackson is exonerated of all these charges. Click here to read the minutes from the final meeting. 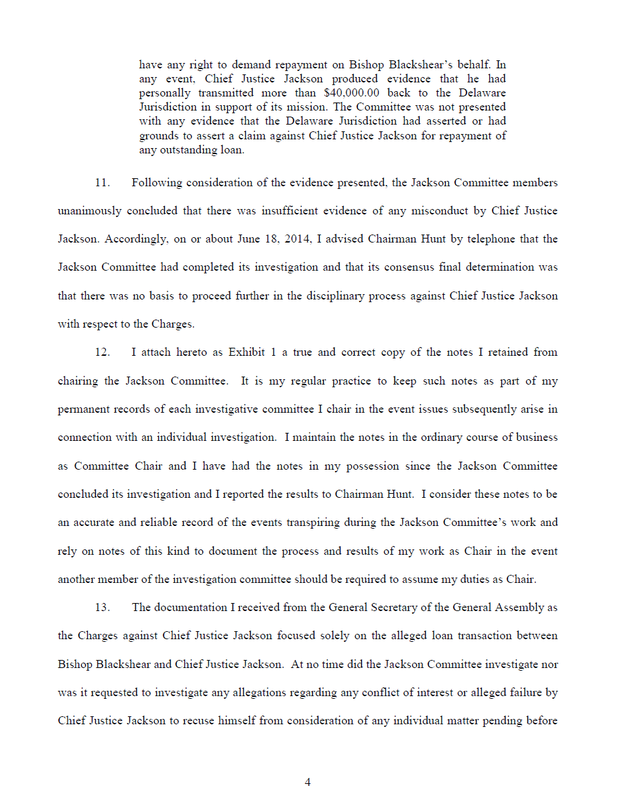 Also, here are excerpts from a declaration by the chairman of the Investigating Committee. The Investigating Committee is to be applauded for its thorough investigation. By looking at the evidence and talking to both parties they have set an example for others to use. For the complete documents, contact me by using the supplied form.